After two interviews, pictures of guest speakers and comments by people who had already seen Tales from the Woods, the Hallowe’eny play brought by Theatre Upstairs and The Gumption Theatre Company, I thought I knew the performance inside out. How wrong was I! I was nicely surprised from the moment I walked into the auditorium of Theatre Upstairs. Absolutely gorgeous set, designed by Theatre Upstairs very own Laura Honan, puts you into the right mood straight away. The ginger leaves covering the floor, a self-rocking chair, a spooky doll, an old-tape player… there is no place for a mistake: you are not in the middle of rainy Dublin anymore. This is the dark, mysterious, dangerous for some, liberating for others Woods. The light and the sound effects howling somewhere in the background just add to the intimate atmosphere of stepping on the unknown path, where there is not a single light at the end. Chapter I: “The ballad of Ginny Fogarty”, written by Kate Gilmore and directed by Karl Shiels. This piece is based on the song “The River Saile”, which is a very obscure tune, telling not such a happy story of a woman who killed her baby. The mini-play features three girls: Eilís Carey, Marnie Mccleane-Fay and India Mullen, who are playing truth or dare. And, as it happens, in the best traditions of an old haunted house horror films, one of the girls is being dared to knock on the door of an abandoned house where Ginny Fogarty once used to live. No need to say that nothing good comes out of this idea. The piece features an absolutely beautiful and tragically touching interpretation of the song performed by Kate Gilmore. 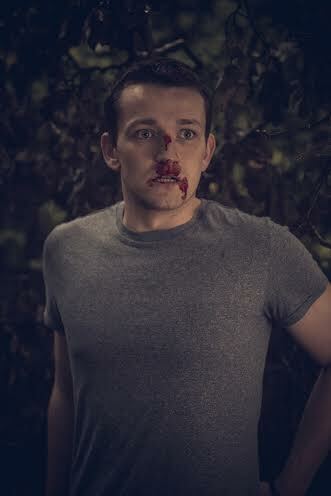 Chapter II: “The beast in the woods”, written by Gary Duggan and directed by Karl Shiels. This “Little Red Riding-Hood” type of story that marries the modern world with the old prejudice. Are things always what they seem? The woods is indeed a very dark place… it’s probably the only place, where you’d rather meet a lonely male stranger than a small little girl. This full of symbolism mini-play features India Mullen, who gives an extraordinary performance as The Girl, and the voice of Gary Duggan. Chapter III: “The children played at slaughtering” is a mini-play developed by Karl Shiels and The Gumption Theatre Company. The third and last piece is the darkest one. Rayne (played by Shane O’Regan) and Root (played by Dave Rowe) are two brothers from a small village, who decide to play at slaughtering one day. Naive (or maybe not so much?) one of them takes the role of the butcher upon himself, the second one plays his assistant, the third, a younger boy, is playing the pig. When the two brothers finally reach the pig, they kill him. But shall the young brothers be punished? This grim story of lost innocence and justice also features Marnie Mccleane-Fay, who brilliantly plays the silent Plague Doctor. This spooky and very atmospheric production is a perfect proof of how many levels a theatre can work on. Such a beautiful and strong interpretation of every single character by The Gumption Theatre Company brought up the creepiest in each one of the three mini-plays and made you feel your hair standing up on the back of your neck. The effect is even bigger when you realise that you are part of the show and in front of you are real people. Theatre Upstairs is a kind of house you would want to knock on the door of on Hallowe’en for they have a whole hand full of treats for you! Hallowe’en is fast approaching and Theatre Upstairs has a real treat for you this year. “Tales from the Woods” is a play compound of three original pieces written by Kate Gilmore, Gary Duggan and Theatre Upstairs’ very own Artistic Director Karl Shiels. The short plays will be brought to life by the amazing members of the fast rising and highly acclaimed The Gumption Theatre Company, that lives up to its name. I had a chance to chat to the lovely founding members of the company: Marnie McCleane-Fay, Eilís Carey, India Mullen, Shane O’Regan and Dave Rowe. We met in Theatre Upstairs, where The Gumptions are deep gone into the woods rehearsing for the show, which is opening on Tuesday, October 27th. The Gumption Theatre Company was founded by The Gaiety School of Acting’s graduating class of 2014. Today the company counts with a total number of 7 core members. I was lucky enough not only to see their graduation play Dirty Laundry (written and directed by Chris Edmund), but I also witnessed their performance in The Critic (DTF2013) and Bee-Loud Glade Cabaret concert. My first question, naturally, is about what made them choose the acting path. Marnie says that she comes from an artistic family and theatre has always been a part of her life. 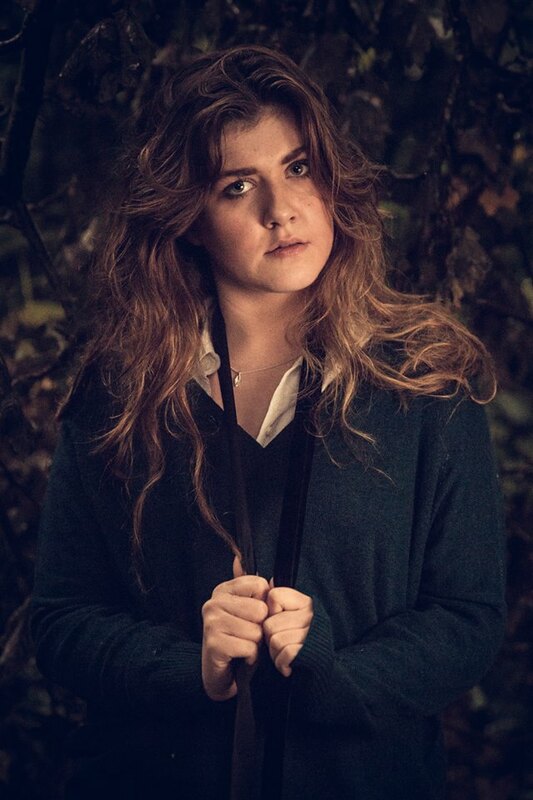 In Eilís’ case, before auditioning for The Gaiety she had already gotten a degree in Irish and History and a Master’s in Military History; but seeing her dad and grandmother taking part in an amateur theatre group inspired her to give it a try herself. Dave remembers himself watching TV when he was still a small boy; the characters, the story lines, everything inspired him to come up with his own scenarios; he even built hand-made sets inside shoe-boxes. India was involved in acting and dancing since a very young age; in addition to that, her mother was a big theatre lover and enthusiast, who used to bring India and her sister to see a lot of different (often obscure) plays and shows. For Shane acting started in his mom’s car, when they were waiting for his older sister going to private speech and drama lessons; tired and bored of waiting around, he asked if he could join in as well. Different lives, different experiences and stories behind each one of them, but the result is life brought them all together to make a little history on the pages of Irish theatre. It’s been just over a year since the young actors graduated from The Gaiety School, with four productions (two mini-plays and two full-length plays) they are already doing quite impressively. Seven members might sound like an awful lot of people, but The Gumption members told me that they are getting on really well with each other. And having such a wide range of people in your company can be quite helpful and reassuring sometimes; team-work and having people with diffierent strength and talents can be a real undoubtful benefit. Upon their graduation and formation of the theatre company, The Gumption was approached by Karl Shiels and Laura Honan, who offered them a chance to compose a play of individually written pieces and put it up in Theatre Upstairs for two weeks. For starting out actors, this was an opportunity not to miss. During that first collaboration with Theatre Upstairs, some of the members of The Gumption took upon themselves the roles of producers and dramaturgists, as well as writers and actors. The result of this collaboration was a devised full-length play “Out of print”. Marnie says that, as actors, they have some essential qualities in common: they are all strong writers and performers. Eilís says that because they’ve worked so closely with each other, they’ve developed this crucial trusting bond. They can safely display any work-in progress or present a fresh idea to the group and expect honest constructive feedback. More than a theatre company, The Gumption can be described as a collective of young talented artists, who are ready to undertake any creative task to make a production happen. Apart from the Gumption, all members have separate projects they are working on and compound part of other theatre or film companies. When it comes to making the final decision, there is no straight regulation as in who will have the last word. They all understand and respect each others opinions. Finally it comes down to who created the piece and who is going to be involved in its production. At this stage (with Tales from The Woods being its fifth production), Marnie Maccleane-Fay is the person who has been involved in every single piece; she has also written a piece for this year’s Collaborations festival. While for Shane O’Regan, for example, it’s actually going to be the first time acting with the Gumption. “The Ballad of Ginny Fogarty” by the fast rising actress and writer Kate Gilmore, who is a graduate of The Gaiety School of Acting herself and a founding member of The Cup Theatre Company. Kate has recently appeared in the hugely successful musical “The Train” by Rough Magic. “The Ballad of Ginny Fogarty” is a short piece based on a song and will feature the three girls: India, Eilís and Marnie. The second piece “The Beast in The Woods” is written by Gary Duggan. 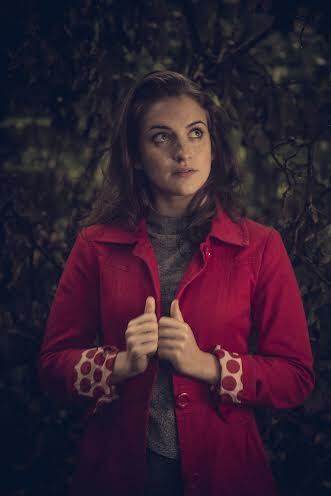 It will feature India Mullen, who plays The Girl, and the voice of Peter Gaynor, who plays the man lost in the woods. As India puts it “It’s a Little Red Riding Hood -esc play; it’s the most fairy-tale old school Hallowe’en type of play”. The third piece is “How the Children played Slaughtering” by Karl Shiels. The piece will be re-enacted by Dave, Shane and Marnie. It’s inspired by one of the most obscure fairy-tale by The Grimm brothers that was taken out from the latests editions of the book. Dave, Shane and Marnie are telling me that working with Karl as the director of the piece is very inspiring in itself. He is a very open-minded person, who allows his actors to develop their own characters and is always welcoming of new ideas and suggestions. With the music and sound effects by Derek Conaghy, this is, no doubt, the scariest piece of all. Theatre Upstairs didn’t stop there and the fun will be well continued even after the performances; each night (and matinee) there will be a special guest reading one of the good auld Hallowe’en stories to the audience. With each piece being only about ten-minutes long, the Gumptions are revealing to me that it’s really challenging to flesh out your character as much as possible in such a short time. Marnie says that basically it’s “creating a huge personality and shrinking it back” into the amount of time given. Dave says that the shortness is something that he actually enjoys about this project; there is no time for wobbling around; “It’s like the snap shot of the story”, he says “you are going into it and immediately you are ripped back out. You get to the point with no fluff about it.” Eilís says that for her, it’s interesting to be able to give to the audience the whole arch and the experience of meeting her character in such a short amount of time. Marnie compares the experience of working on this project with their first show “Out of print”, where everyone was given roughly five-six minutes on stage to present their characters and stories. The Gumption is still in rehearsals, so Marnie points out to me that a huge difference will make the set, the costumes, the light and sound effects. In her case, the costume will change the physicality of her character and it’s something you might not know or take into consideration while rehearsing. Eilís adds that it’s really rewarding to finally start rehearsing with real props and just get the touch and texture of them, which can be real influential on your final performance, as well. The rehearsals and bringing the whole piece together have been really rewarding and fun so far, as the Gumption tells me. Karl and Laura in Theatre Upstairs are amazing people to work with, who try to take care of as much as possible, so the actors and the creative team can fully concentrate on the play. For actors it’s crucial to be able to play around with their characters, bring it to different extremes and see what might come out of it. Being all of them graduates of the Gaiety School of Acting, the guys are telling me that John Delaney and Helena Walsh, two tutors at the school, were a huge inspiration for them. Both John and Helena are amazing people to work with and to be taught by. In Helena’s class, I’ll take the liberty to say, you are being more then simply taught, she is sharing her profound wisdom with you. Interestingly enough both teachers encourage you “not to be afraid to fall”. Or “fail beautifully”, as Helena likes to repeat. As for the future productions: Dave Rowe is currently working on an original piece of script for the company. Marnie’s “The Valley of Dolls”, that was originally produced as a short piece (starring India Mullen and directed by Aonghus Og McAnally), will be transformed into a full length play and presented to the audience early next year.